Historic stock certificates are one of the favorite antiques of the 21st century! More and more Scripophily collectors as well as investors have discovered antique shares and bonds. In some Scripophily categories values are steadily increasing. Investors collect according to many different criteria like industries and regions, but also according to their own motives or even artistic styles of the certificates. The sky is the limit when it comes to their creativity. 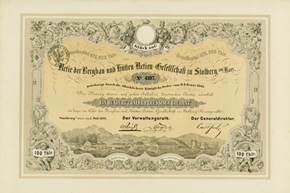 Early stock and bond certificates were known for their very elaborate design: The more elaborate, the more the investors were convinced of a certain future profit. However, bankruptcies were quite common among the companies producing these certificates. What remains to this present day are highly decorative works of art. Additionally, these historic investments often tell dramatic stories of pioneers like Thomas Alva Edison, John D. Rockefeller, J. P. Morgan or Werner von Siemens. Even the ups and downs of the stock market are being documented by these antique stock certificates - they are the written proof of the bull and bear market. Going once, going twice, going three times ... sold! 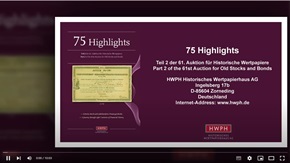 HWPH AG is one of the leaders of world-wide auction houses for old stock and bond certificates (Scripophily). The team around Matthias Schmitt promotes two large scale auctions per year: one in Würzburg and one in Wiesbaden. HWPH auctions exclusively offer pieces owned by its customer base. HWPH AG does not own the stock or bond certificates; all pieces are owned by their various customers, even the ones advertised in the OFFERS category.